Safariland’s UBL holster adapters are extremely handy. They drop the holster just enough to provide clearance for gear like body armor while not placing the holster too far down the wearer’s leg. The only problem is that this dropping the holster below the belt can allow the holster to rotate or move during the draw stroke which can cause binding. 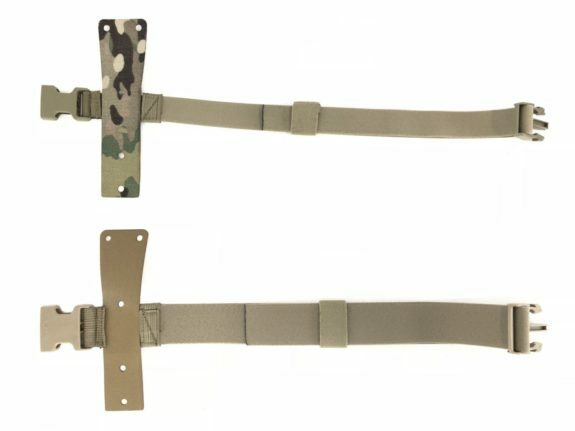 The Safariland Holster Single Leg Strap Adapter from Arbor Arms seeks to fix the binding issue by securing the holster to the wearer’s leg so that it can’t tilt away from the wearer. The adapter works in conjunction with the Safariland UBL 6070 series drops and includes a laser cut laminated nylon aramid backed material panel and a strap. 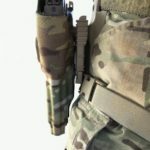 The panel bolts between the holster and UBL drop and can accept either 1″ or 1.5″ straps. It is available with either or both strap sizes. Single strap setups have frequently be improvised with UBL drop adapters by simply sandwiching a strap between the holster body and UBL. 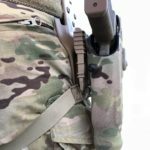 This works but places the strap higher on the holster which places it a steeper angle as it wraps around the wearer’s leg and can lead to discomfort. The Arbor Arms USA Safariland Holster Single Leg Strap Adapter places the strap lower which could be more comfortable.